A great episode that may have caused me to head to the dark side of dramaland that is “second lead syndrome”, but the end had me back rooting for GookDae. I feel that for a while this cycle may rear its head! The meeting is under way and Kevin is enthusiastic about the strawberries. He says they taste especially good, but that may have something to do with who washed them. Kevin and SongAh then share several glances. Kevin’s looks rather smitten, while SongAh looks a little confused. conversation. After the meeting, DoeHee finally speaks and ask what is going on between SongAh and Kevin (she even counted how many glances haha). SongAh thinks it’s nothing, saying it’s probably some American etiquette of looking people in the eye. SongAh thinks to herself that she must have misunderstood and that there is no way such a handsome guy would like her. 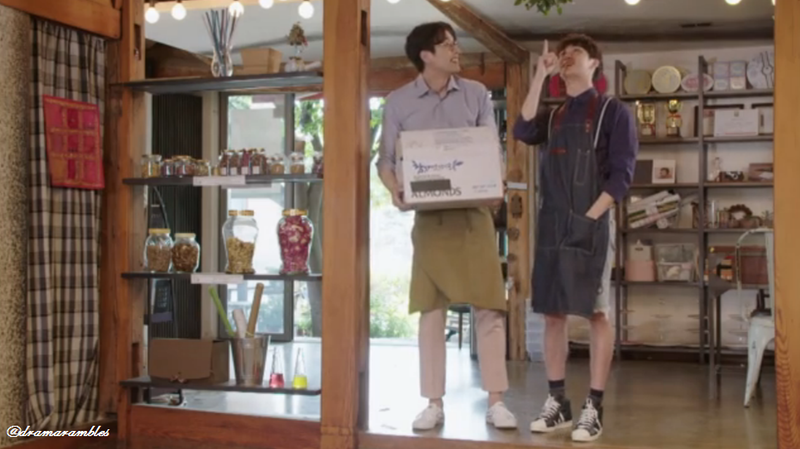 Cue Kevin coming to her “rescue” a few times when she is struggling with carrying things/opening doors. Having gotten the office coffee, he gives her a cup and a shop card on top (with a cute note attached saying “please use this”). Using the card she goes down to the coffee shop. SongAh thinks he must be being so nice because she is the youngest on the team and happily drinks her coffee. However, her happy mood is cut short by an incoming call. GookDae wants to know where she is and SongAh grumpily tells him she is on her way. Once she gets there is gets her started straight away with organising and cleaning. While she is putting pots and pans on high shelves, GookDae starts teasing her about her height, which she most definitely doesn’t like. GookDae then takes up a horizontal position on the seat opposite the cooking counter, snacks and a huge stack of manga to hand. He starts barking orders at her and eventually SongAh starts to complain that she has to work as well as do this. She asks if he can shave time off her contract (which has 76 hrs left) and even does some extreme aegyo. 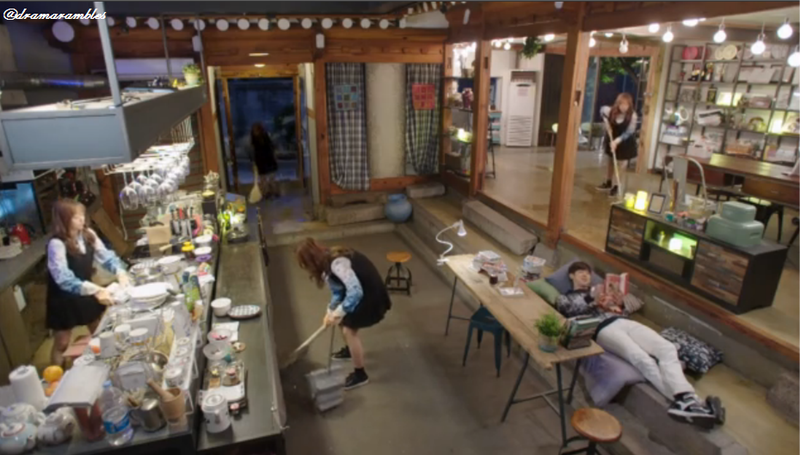 GookDae says no and then leaves her to clean. The next day at her office job, DoekHee is unimpressed by SongAh (who is falling asleep hugging a cute plushie). SongAh does get some pity by bringing up the bags under her eyes. DoekHee tells her to use her beauty to seduce GookDae, but SongAh complains that it doesn’t work on him, not to mention his better looking than her (poor baby). DoekHee calls her pitiful for having to work two jobs every day and right on cue, SongAh gets a text from GookDae telling her to come to FLada as soon as she finishes work. DoekHee returns to her desk as Kevin walks up to SongAh’s. She jumps up and Kevin calls her a robot, then gets her to sit down. He crouches down beside her chair and asks SongAh if she will go to the company dinner he wants to have, and then asks her to find an appropriate place (does she think it’s an excuse to ask her out, or to get time off her contract? You never know quite where her mind is going haha). At FLada, GookDae is perusing his bookshelves and comes across at book which makes him think of his promise to SongAh. He looks all set to make a cookie for her until he gets a message from him saying she’s busy with work so can’t come today (he looks so disappointed). Meanwhile, SooRi is putting up mistletoe at the entrance. 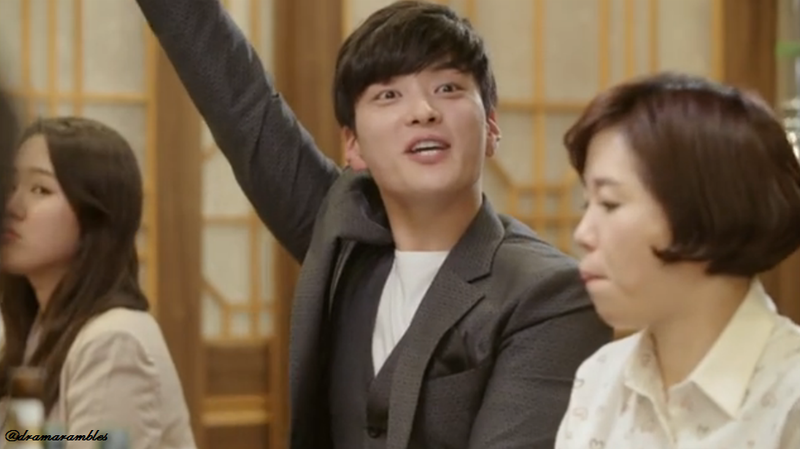 He happily explains that he loves the tradition to BiRyong, who asks if he plans to use it on Suzy. However, we learn that she is long gone and he has another girlfriend – Hyeri, who is coming to the restaurant in the evening. This leads nicely into SooRi pleading BiRyong to help him get out of a restaurant outing tonight. SooRi didn’t need to worry as GookDae walks in and cancels the plans. After he leaves the room, SooRi speculates that something is going on between GookDae and SongAh as he always calls her. At the company dinner, Kevin and SongAh are sat opposite each other (I love how DoekHee grabbed the seat next to him and she looks so happy and smug about it!! ♥). Kevin’s attention is fully on SongAh and he is happy to see her eat (even if she takes it sort of the wrong way, but thinking he’s implying she eats too much). After evading being fed by DoekHee (HA!) Kevin asks SongAh if there is anything else she would like to order, she goes to reply, but her colleagues want to move on. Kevin raises his hand to say he isn’t done and orders what SongAh timidly suggested, offering to share as there would be “too much” for him (this guy is too cute, I’m legitimately getting second male syndrome right now. GookDae needs to step up!). At the next restaurant, Kevin tells everyone that maybe they should stop drinking now, but the team are laugh. We then move on to see the team chanting (Kevin has no idea what’s going on, but he’s still trying to sing along! So cute~). He is then forced to do a one-shot, which bless him, he does not enjoy. While taking a breather outside, SongAh wonders if she will get into trouble with GookDae. Her thoughts are interrupted by Kevin, who has come out to give her an ice-cream, saying it will help wake her up. He also tells her not to drink anymore. 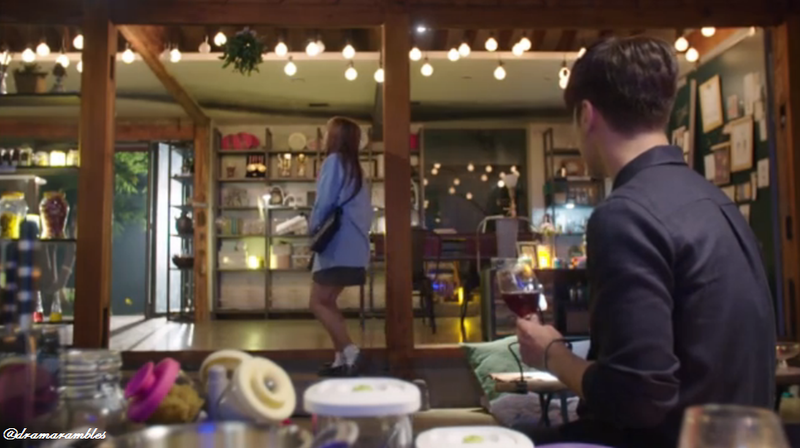 SongAh agrees and smiles as she looks in on the party, where he has returned (haha DoekHee is dancing on him!). At the end of the night, while everyone says their goodbyes, DoekHee happily clings to Kevin. However, he untangles himself to walk with SongAh, saying he is going in the same direction. SongAh tells Kevin to go on first as she tends to get udon after she has been out drinking. Instead of getting rid of him, SongAh ends up being offered a free meal. Once seated, SongAh notices GookDae and hides behind her bag (after eye contact and even so that is not inconspicuous!). GookDae orders and invites himself to sit at their table. Kevin asks who he is and GookDae hands him his business card (what?!). Kevin is curious about their relationship and SongAh explains that she works part-time at FLada (this is going to be awkward and cringe-worthy, I can feel it in my soul *cries*). Kevin tries to keep the conversation light and friendly between himself and SongAh, but GookDae is not in the mood. He tells SongAh that she should finish and go to work. Kevin gets startled at the term ‘night work’ (haha he is definitely misunderstanding) and instead tells her she should go home as it’s late. GookDae challenges this by saying that SongAh is indebted to him, once again causing confusion. SongAh quickly rambles about she isn’t in debt to him, but is and that she works free for him instead of paying money because of an incident. GookDae gets up and soon after SongAh follows after apologising to Kevin for leaving first (but she didn’t get to eat her noodles…). At the restaurant SooRi is wooing Hyeri with food and wine. He goes in for a kiss but is interrupted by GookDae turning the lights on and telling him that he said not to bring his girlfriend here. Hyeri wonders who GookDae is and comes to the conclusion that he is one of SooRi’s employees. SooRi clamps his hand over her mouth and quickly runs out of the restaurant with her (haha that kid!). SongAh asks if he is going to make her peel garlic, but to her delight her job this evening is to taste samples. GookDae explains that he has made a hangover menu for workers who are tired out from drinking (he’s being cute). The cooking montages are beginning (this drama makes me so hungry). SongAh watches on and becomes a little tired/impatient, causing her to walk over to the counter. He tells her to sit down, because he can’t concentrate, but even so smiles happily at her when she pinches some of the food. tells her to appraise it honestly, and asks if his is better than “that udon place”. According SongAh the noodles are soft, unlike his character. While GookDae takes a sip of wine, SongAh gulps down the food, much to his shock! He asks how such a small girl can eat all that and she confidently says that she will eat a lot and grow! SongAh then goes to leave, but stops when she notices the mistletoe and asks GookDae what it is. She asks what happens if you don’t kiss and he tells her that you get cursed. SongAh says that this excuse must be a new method of flirting. She says goodbye and starts walking out. I’m liking how this is progressing. I enjoy all the characters and I love how upbeat it has been so far. Obviously this is dramaland and ‘upbeat’ always takes a break at some point, but so far the build-up has been warm and quirky which I love. Kevin is a character I did not realise I would love so much seeing as we only met him in the last few seconds of the previous episode. But he is adorable and his little face lights up when he smiles and he needs to do something terrible for me not to like him or secretly ship him with SongAh. I mean he could also be a cool second male lead and not get all clingy and jealous etc. and date DoekHee (I mean imagine how hilarious that would be! Plus that women deserves some loving because she is hilarious!). Anyway, that kiss though! Normally with a lot of “idol actors” the kiss scenes aren’t that great and tend to be awkward and even though it starts out awkward, that isn’t on his side and was part of the story as you’d be surprised if someone suddenly kissed you as well! SongAh continues to be her cute self and I’m looking forward to seeing how the events of this episode effect relationships and plot. Thankfully, even though this webdrama is shorter, there are more episodes than normal so we will hopefully have time to have a good delve into the romance and plot. 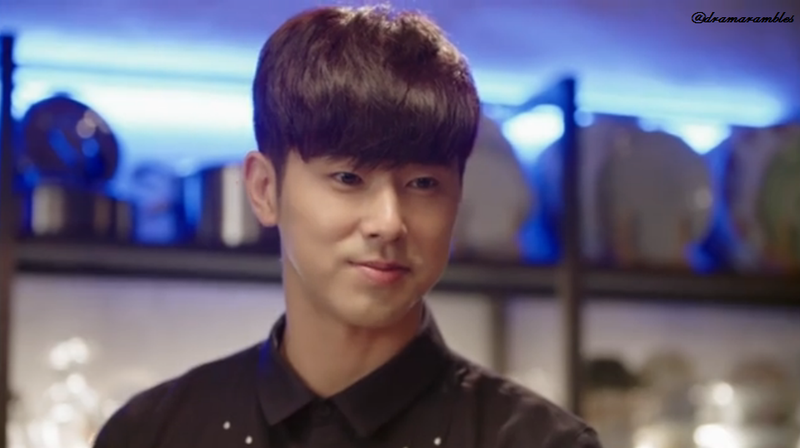 This is a really good drama and your recaps are really detailed, keep the good work!